For years Republicans (including John McCain) raised a lot of cash on their promise to get rid of Obamacare. Then, when Donald Trump shocked the political world and won the White House, they were in a position to actually keep that promise to voters. Instead, then-Senator McCain (along with Senators Susan Collins and Lisa Murkowski) voted no on repeal and yes on keeping Obamacare fully intact. One outgoing member of Congress now thinks that is when Republicans’ hopes for keeping the House in 2018 were doomed to fail and that McCain’s no vote had nothing to do with doing what was right for Arizona voters but rather was meant to feed McCain’s desire to rebuke President Trump. An outgoing Republican lawmaker on Sunday blamed former Sen. John McCain for the GOP’s loss of the House majority in last week’s elections, writing in The Wall Street Journal that it was McCain’s decisive vote against legislation to repeal and replace Obamacare that led to a wave of Democratic midterm victories. Jason Lewis, a Minnesota congressman who was unseated last Tuesday by Democrat Angie Craig, claimed in his op-ed that McCain’s thumbs-down vote against a so-called skinny repeal of the Affordable Care Act “prompted a ‘green wave’ of liberal special-interest money” that he said allowed Democrats to hammer Republicans on the issue of pre-existing conditions. Lewis wrote in his op-ed that the failed Senate vote allowed Democrats to campaign against Republicans with the claim that the GOP wanted to remove protections for those with pre-existing conditions, a keystone of many Democratic campaigns leading up to the midterms. Although McCain was one of three GOP lawmakers to vote against the “skinny” repeal, Lewis singled out McCain for his “no” vote — which came after he criticized Republicans for trying to push a repeal bill through and called for the return of regular order — as an unnecessary attempt to slight President Donald Trump. The above sentiment by Congressman Jason Lewis is true. John McCain was very much a willing part of the “we (Republicans) are willing to lose 2018 if it means hurting Trump” sentiment. Well, they got what they wanted. Democrats took the House, (while still attempting to steal the Senate) and President Trump’s America First agenda is now facing even greater political opposition from the globalist, America Last, D.C. Swamp. John McCain is gone but the political corruption he helped expand from one coast of America to the other, very much remains. Branco is once again on point. It was just ten years ago that the Establishment Media lambasted then-presidential candidate John McCain as an out-of-touch, possibly unhinged, (thus dangerous) angry old white and warmongering, old man. Mr. McCain, who always yearned for media approval, then began to rehabilitate himself in the eyes of the media by attacking Donald Trump and after a couple years of doing so, the very same media that loathed him transformed the Arizona senator into a ‘national treasure’ and political saint. It is media hypocrisy at its most glaring and once again proves how the Establishment Media is nothing more than globalist propaganda that seeks to further divide and weaken the United States. John McCain detested Donald Trump so much so that he willfully participated in assisting the Hillary Clinton campaign with what became the Trump/Russia collusion hoax. The longtime Arizona senator was said to be increasingly bitter over the likelihood he would not live to see the destruction of the Trump presidency. That bitterness would likely be worsened if McCain knew his replacement was former longtime Arizona senator, Jon Kyl—a man now firmly on the side of President Trump. Kyl was not an immediate passenger on the 2016 Trump Train but his criticisms of the then-insurgent Trump campaign were muted and based primarily on Trump’s bellicose campaigning style. As Trump’s presidential successes grew so too did Mr. Kyl’s respect for the job the president was doing despite significant political and media-driven opposition. (He once admonished the anti-Trump media and told them to cut Trump some slack.) This respect recently culminated in Kyl’s willingness to assist in the now-ongoing (and critically important) Supreme Court appointment of Judge Brett Kavanaugh. Where John McCain’s ego and sense of self-importance and entitlement were so often front and center, Kyl’s leadership is both more subdued, stronger, and ultimately more successful than McCain’s long but dubious record of actual legislative achievement. Make no mistake, replacing McCain with Kyl in the U.S. Senate is a big win for the Trump White House. Two funerals received national attention this week: Aretha Franklin’s and John McCain’s. President Trump did not attend either one yet was clearly inside the heads of those who did. Liberals and globalists infested both occasions and would spit out the occasional anti-Trump remark of which the Establishment Media would then replay in a loop for the next three hours. Meanwhile, as these political and entertainment elites continue to appear jaded, spiteful, and increasingly tone-deaf, Donald Trump continues to rack up one impressive policy victory after another as America flourishes in this Age of Trump. In the middle of the liberal media’s desperate efforts to convince us that President Trump is in trouble, there are an amazing number of victories that suggest he is winning. In fact, there are indications that he is winning a lot. Let’s start with Tuesday’s primaries. In Florida, a fine, well-entrenched state Agriculture Commissioner and former U.S. Rep. Adam Putnam decisively lost the Republican gubernatorial primary to Rep. Ron DeSantis. The big boost for DeSantis came from President Trump’s endorsement and a Trump robocall to Florida Republicans. The contest for governor of our third-most populous state shaped up even better for Republicans as a hard-left Bernie Sanders-backed progressive – Tallahassee Mayor Andrew Gillum – won the Democratic primary with 34 percent of the vote. The contrast between a pro-Trump DeSantis and Gillum will probably keep Florida in Republican hands in November. Florida gave President Trump and Republicans a second boost as GOP Gov. Rick Scott won an important primary victory for a U.S. Senate seat. Scott has proven in his two campaigns for governor that he is an aggressive, effective campaigner. It is very likely the blue wave in Florida will disappear with the DeSantis and Scott victories. It is clear that the president’s judicial and economic victories build his prestige, and that prestige is giving him the muscle to reshape the Republican Party. In Arizona, President Trump won another primary victory when Martha McSally, a congresswoman and Air Force veteran (in fact, the first American woman to fly a fighter jet in combat) won the Republican U.S. Senate nomination. President Trump praised McSally earlier this month at the signing ceremony for the National Defense Authorization Act. What looked at one time to be a close contest became a blowout, as McSally won 52 percent of the vote in a three-way race and was 24 points ahead of her closest competitor. Republican chances of keeping the Arizona seat are dramatically better with McSally as the nominee. Beyond the primaries, President Trump has been winning amazing victories in nominating – and with the leadership of Majority Leader Mitch McConnell, R-Ky., getting the Senate to confirm – federal judges. Where Hillary Clinton would have nominated radical judges, President Trump has been consistently nominating constitutional conservatives to the courts. This will have a profound impact on America’s future. So far, President Trump and McConnell have confirmed 60 federal judges – this includes Supreme Court Justice Neil Gorsuch, 33 district court judges, and 26 court of appeals judges. Additionally, President Trump has nominated more than 80 other judges across the federal system (including Supreme Court nominee Brett Kavanaugh). McConnell has been doggedly working to get these nominees confirmed, and I suspect he will drive them through the Senate before the end of the year. So on judges, President Trump is winning an amazing victory for conservatism. No wonder the left is in a frenzy. Finally, the breakthrough in trade negotiations with Mexico is, to use one of President Trump’s favorite words, huge. Most of the so-called experts had said the North American Free Trade Agreement (NAFTA) couldn’t be renegotiated. They insisted President Trump had offended Mexicans so much with his harsh language that the Mexican government wouldn’t come to the table. They asserted building the border wall would alienate the Mexican leaders. They were just plain wrong. Making good on a big, disruptive pledge that set his 2016 campaign apart from every other candidate, the president kept his word and is forcing a difficult negotiation toward success. President Trump proved, once again, that tough language and tough negotiating can actually lead to breakthroughs. Unlike most politicians, Trump is willing to endure heat to achieve success. As a result of his seriousness on trade, other countries are now approaching President Trump about trade negotiations (note German Chancellor Merkel’s call this week for trade talks). Canadian Prime Minister Justin Trudeau tried to be clever when he ambushed and attempted to embarrass President Trump during a press conference at the G-7 Summit in Canada. Trudeau is now discovering that Trump has a good memory. Canada now has virtually no leverage in trying to play catch-up with the U.S.-Mexico negotiations. The Trump administration’s continued attention to economic matters – despite the liberal media’s daily efforts to get him and his team off-balance through dishonest reporting and smear stories – is paying off. The average American sees the economy getting better and better. And the average American increasingly thinks the success is due to President Trump. It is an amazing story. No one in the liberal mainstream media apparently understands, but historians will look back on this period in amazement. They will clearly see a political-cultural battle between an aggressive, effective, successful president and a disoriented, defeated and demoralized news media. Clearly, President Trump is winning. The founders of the controversial opposition research firm Fusion GPS admitted that they helped the researcher hired to compile the infamous, largely discredited 35-page dossier on President Donald Trump to share the document with Sen. John McCain. 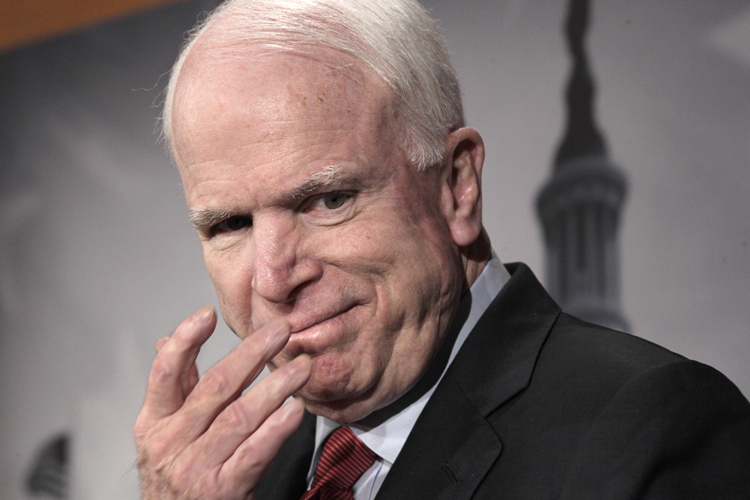 Globalist senator John McCain has once again indicated his support for keeping the failed and insanely expensive Obamacare disaster intact much to the delight of Big Pharma and even more nefarious socialist groups that have long sought to collapse the U.S. economy from within. Last week socialist senator Bernie Sanders declared Obamacare was failing and a line of Democrats agreed, and yet those same senators and John McCain are fighting to preserve that which they admit is a disaster for the American people while other spineless Republicans who took money from supporters after promising them they would repeal and replace Obamacare, shrug and shuffle off hoping to be re-elected yet again in 2018. Here is Senator McCain calling Obamacare a failure, a disaster, unsustainable, hurting American families, etc. as well as denouncing Democrats who demand Republicans work with them to “save” it. This was less than a year ago. 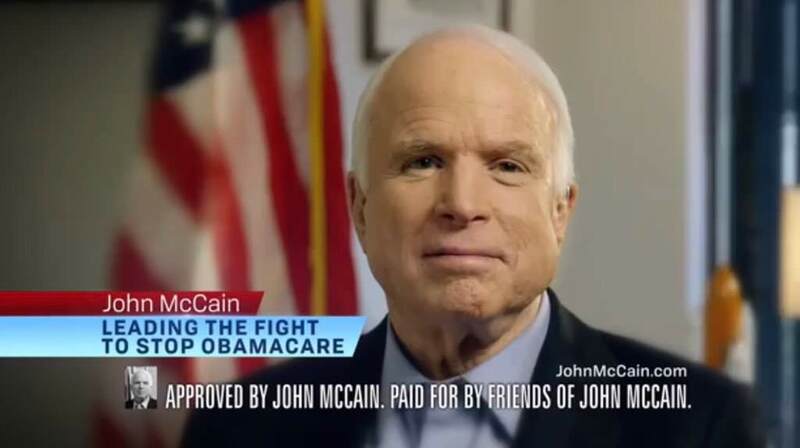 Last night John McCain voted to SAVE Obamacare. He is a phony and a fraud who has taken money from voters while promising to fight Obamacare and he represents far too many in Congress who have done the exact same thing. The current POTUS refuses to play by their rules, leaving the Deep State increasingly frustrated over its inability to control both the message and potential outcome of near-term U.S. policy both at home and abroad. No more clear signal of this fear can seen than that of the weekend news program appearances of former CIA Director John Brennan and anti-Trump Republican Senator John McCain. Both men were spinning big time in an attempt to downplay the considerable success and gravitas POTUS Trump put on display during the most recent G20 meeting in Germany. Brennan said, “I don’t think he demonstrates good negotiating skills when it comes to Mr. Putin. Two days ago in Warsaw, he gave Mr. Putin the opportunity to point to the failures of U.S. intelligence. “I mean, does anyone doubt his intentions of undermining American supremacy, undermining democracy, the principles of freedom, and all of the things that have epitomized Europe and the world since the end of World War II? For the last 70 years we’ve had a new world order. And that is now under severe stress not only in Europe but all over the world,” McCain said.